Make sure that the “User Settable” box is un-ticked so that tickets cannot be mis-categorised. 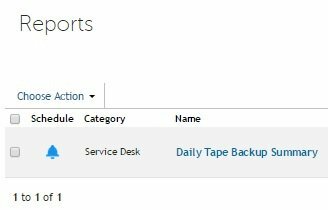 So that you have a summary report of only your open calls regarding Tape Changes, name it something like “Daily Tape Backup Summary”. 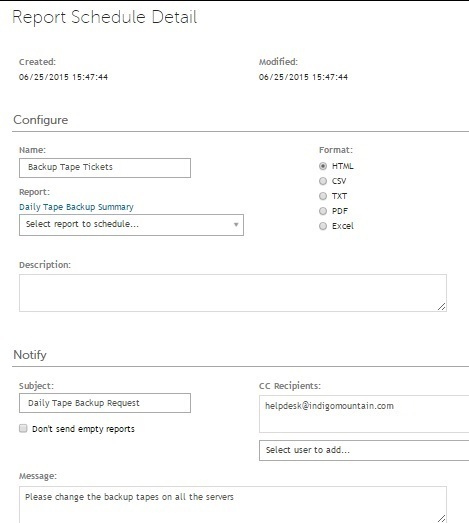 From the report listing screen, click on the Blue Bell Icon next to the Report title to add a schedule. And finally set your schedule as to when the ticket needs to be logged, this can be done as a custom schedule if you only want a ticket logging Monday – Friday. The following image shows the schedule as 16:45 Monday to Friday. This now means that every week day a report will be emailed into your Service Desk and a new ticket will be created on the queue. If all of the above criteria is set, then set the Owner to your Allocated Technician. 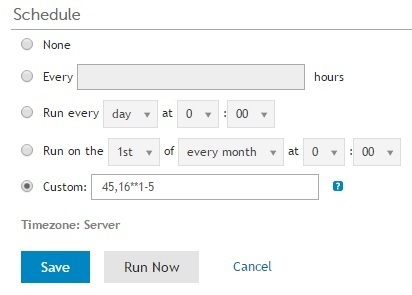 Finally set the rule to run on a daily basis, but leave the time until 10 or 15 minutes after the report schedule is set to run. The result is that every day a ticket is created in your Service Desk Queue and it is allocated to a technician for action, against which you can record time and effort when closing the ticket, which in turn can be reported on a weekly or monthly basis.